Quick and simple project management for freelancers and small agencies. THIS TOOL IS NO LOGER MAINTANED OR UPDATED. My client doesn't want to learn collaborative software, he just wants to follow the progress of his project. I want a quick and easy way to keep my client up to date and keep track of all important documents. 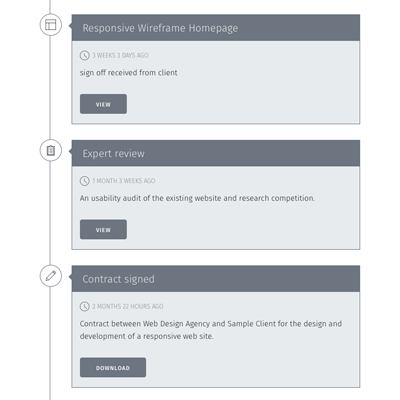 You can design beautiful timelines for your different projects to keep your clients or colleagues up to date. The resulting visual overview is optimized for desktop, tablet and mobile phone. The project pages can be password-protected. Client accounts are readily handled using the admin panel, a password is provided to all authorized users and unlimited projects can be attached per user. 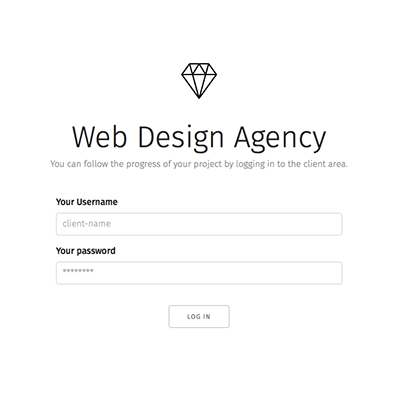 A fast and powerful web-based interface to manage your client area. Holy smokes! @groenewege made an amazing Project Hub tool. This is brilliant! Exactly what I have been looking for. This tool uses the Kirby CMS but you don't have to be a Kirby expert to use it. You can use the Kirby Project Hub as a stand-alone website or you can add it to an existing website. Kirby is a file-based content management system made by Bastian Allgeier. It is easy to setup, ready to use and flexible as hell. This is why we chose Kirby and extended it with a user-friendly client area to offer you this comprehensive project management tool. Please remember that Kirby is not free. If you use our theme for a public release, don't forget to buy a license for Kirby too ! Upload all files and folders to your server. This includes Kirby 2.4, the Kirby Admin Panel and the Project Hub Theme. Do not forget to copy the invisible .htaccess file ! Visit http://yourdomain.com/panel to start Kirby's installer and create the first user account. 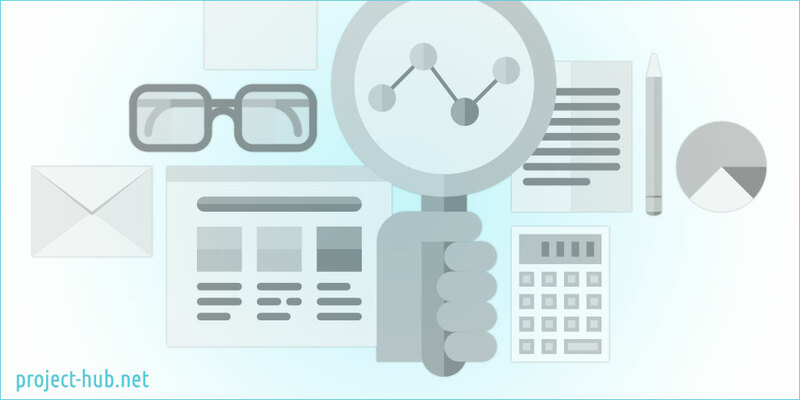 Visit the documentation page to learn how to use Kirby Project Hub. 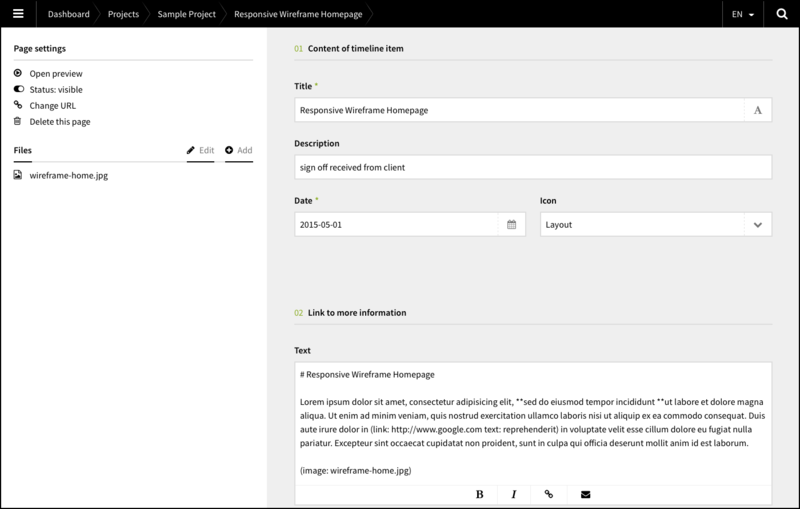 How to add a client area to your website : set up a stand-alone client website or add a client area to an existing Wordpress site. 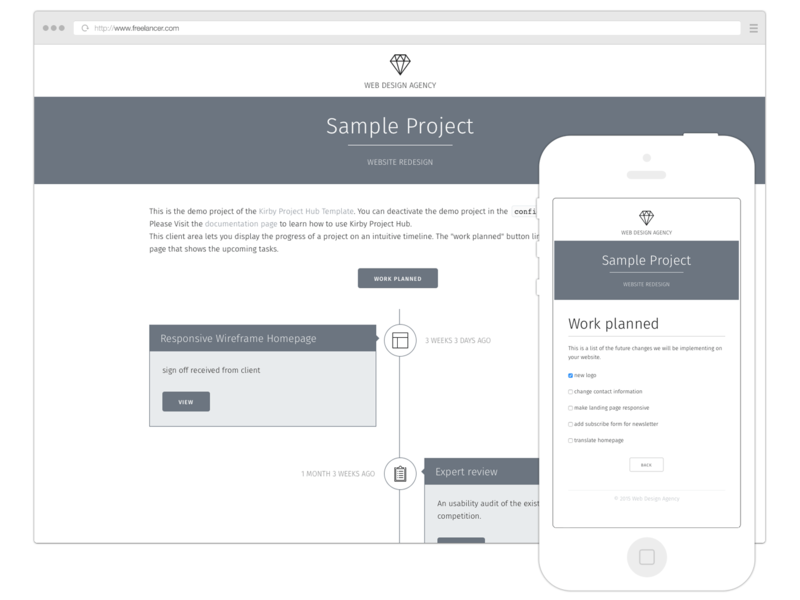 Manage projects with Kirby Project Hub : this tool can be used to track the progress of a small freelance project, but it can also be your project management solution of choice for bigger projects. 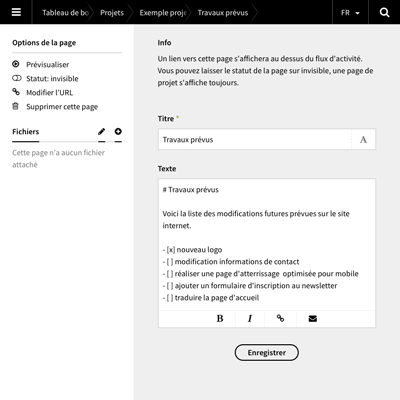 Integrate Kirby Project Hub with other online tools and services by using the new RSS feature : display the latest project updates on a Wordpress site, send an email for every status update, post to Twitter, Campfire or Slack, etc. If you have any questions, contact me by email or via Twitter. Kirby Project Hub is compatible with Kirby 2.4. The trial version of this CMS is included for your convenience. 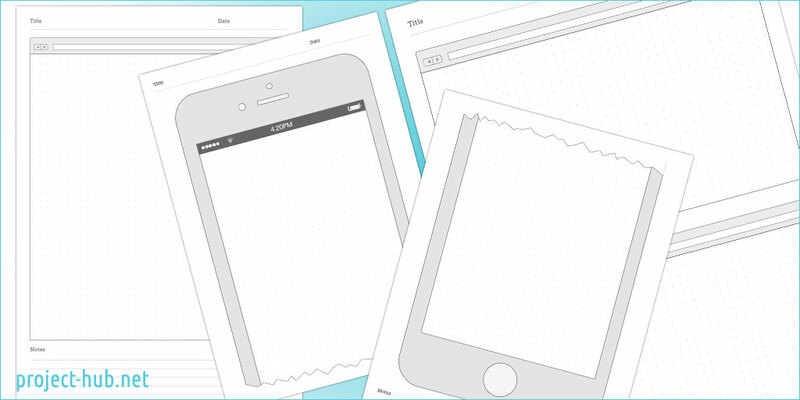 Ready to print wireframe sketch sheets for web designers and app developers with templates of a desktop browser, iPhone and iPad.